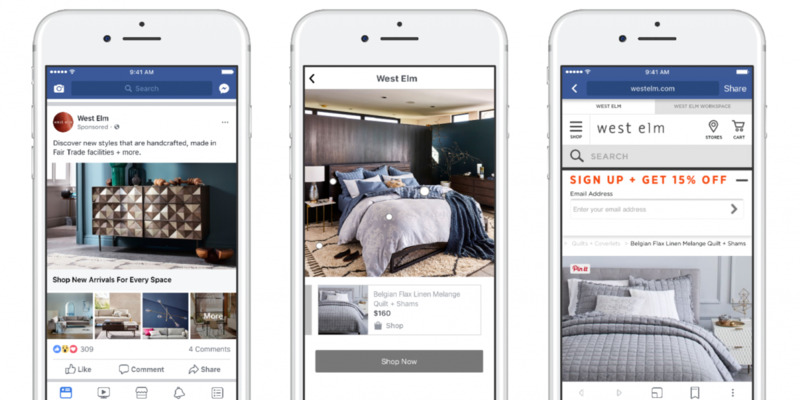 Facebook is launching a new ad product which looks to expand on the best elements of the traditional marketing catalogue approach. As first reported by Business Insider, the new units are called 'lifestyle templates' and will take the user from a News Feed add to an interactive display unit, with each of the featured products in an image shown beneath. You can get an idea of how the process works from this sequence - the ads will appear as shown in the first image (left) in your News Feed. Click on any image in the ad, and you'll be taken to an expanded display, with products identified beneath. The presentation looks like a combination of Facebook's Collections ad units (below) and Instagram's still in-development 'Shopping Tags', which link details to specific items within a frame. "It's fairly widely known that circulation and response rates for catalogues have been declining, but it's still a really important channel for them, so they're looking for a way to sort of bring that to the digital world, and specifically the mobile world." The option is also intended to further improve the 'shoppability' of Facebook ads, providing direct connection to the advertisers' online store for purchase. Eventually, you would expect that Facebook would be also looking to add in-stream shopping, though that's still some way off. It's an interesting consideration, providing new presentation options for Facebook advertisers. And definitely it'll hold some appeal - it enables businesses to create a more contextual, all encompassing feel to their ad presentation, which can enhance the look of more of their products in a single frame. The new lifestyle templates are being rolled out from today.